Metropolitan Police Chief Peter Newsham thanks SOC strategic communication students for presenting their plans to recruit new officers to MPD leadership. 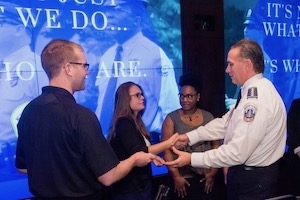 Metropolitan Police Department (MPD) headquarters may not be a top destination for most graduating seniors, but for students in professor Jason Werden's Public Relations Portfolio capstone course, the visit was an honor, and proof that they could perform at a professional level. They were there to present their proposals as to how MPD could improve recruitment efforts to top officials, including Police Chief Peter Newsham; even more impressive is that some of their recommendations have been implemented. The portfolio course is designed to take elements students have learned from strategic communication courses to date and pull them together in a real-world context. Students are assigned a real client, selected by professors, that charge the students with solving a communication challenge. In prior years, faculty in the course have partnered with museums, non-profits or corporations like Marriott. Werden went in a new direction by engaging a high-profile institution in the public sector, the MPD. Werden is an adjunct professor for the School of Communication and Vice President at FleishmanHillard, a global public relations agency. Much of the work the students were doing for the course mirrored what Werden does on a day to day basis, he said. From January to April students pulled together fully integrated campaigns that were then presented to MPD representatives at AU. Later, two of the groups, Nexus Digital and MCK2, were asked to present in front of MPD officials at headquarters. In recent years, the relationship with the public and law enforcement has become one of tension and mistrust. Werden saw this project as not just an opportunity for students to gain experience but for a law enforcement agency to hear from those they serve and start a dialogue. "This has been an ongoing conversation even on AU campus," Werden said. The class had several officers to come in and speak about what they were hoping to achieve in their efforts. Students were tasked with conducting research on their own, along with surveys, focus groups, conducting different interviews with stakeholders, audiences and students and Werden even participated in ride-alongs with officers throughout the seven districts. One of the biggest challenges was the time commitment required of both MPD and the students. Many of them worked with officers who were on duty at all hours of the day. MPD was impressed by the students' deliverables. "They were blown away by the concepts put together," Werden said. "MPD was a great client, different from any of the nonprofit and corporate clients before. This presented a challenge to us as we had to look beyond what we'd learned at AU," Kern said. Kern and her colleagues wanted to provide strategies they could implement right away. "Based on the data we collected it showed that being more veteran/military friendly would help with the longevity of recruitment and help [veterans] get acclimated with civilian life," Kern said. Katlyn Hirokawa, a recent SOC graduate, was in the group MCK2, which took a different approach. "We targeted college students within the DC, Maryland Virginia area. Soon these students will make up a large amount of those entering the workforce," Hirokawa shared. Given the several universities in the surrounding area, MCK2 launched a survey that received over one hundred responses. They were able to identify four key things that millennials were seeking from an employer. MCK2 then used this to highlight the culture, diversity within the organization and suggested in their presentation that this would be a key element in appealing to job-seeking millennials. "They really expressed that they wanted a mission that they could identify with and a culture that they felt welcomed in," Hirokawa said. "We had to educate people that there is more than just a physical element to law enforcement, that officers take on several roles like priest, psychologist or nurturers. We highlighted this to break some of those barriers," Hirokawa explained. MPD Your Next Step was the winning campaign Nexus Media Communications presented to The Metropolitan Police Department. Many of their suggestions have been directly implemented into MPD recruitment. MCK2 also developed materials to show MPD employees how to push content, update LinkedIn profiles, etc. so that they can better engage with their audience; not just using it as a social media platform but to reach out to job seekers as well. Both groups are pleased with the outcomes and the opportunity to work with MPD. "Overall I am really proud. Our campaign aligned law enforcement values with military and this resonated with the client. Taking that extra step worked for them and [MPD] voiced it was something they were seeing in their office day to day," Kern said. Werden feels good about the work the students produced, and the value of the class. "It allowed them to have opportunity to bridge gap from classroom to client. Many of them are going directly into the workforce. It was very rewarding to see the work they put in and the impact they made."